Please Note: The screengrabs used here are from the standard-definition DVD included in this set, not from the Blu-Ray. There's a cliché in police stories where every cop has a case that got away, that haunts him or her even in retirement, the one mystery they could not crack. Artists tend to have those, too. Every creative person has the project that just refused to come off the way they wanted it to, that they can't stop tinkering with or just can't seem to finish. Oliver Stone made three different edits of his bloated Alexander, packing it in only after he used every scrap of footage. Orson Welles had multiple movies in various states of completion when he died, one of the most famous being an adaptation of Don Quixote--a property that has perplexed more than one filmmaker. Terry Gilliam is trying to go back to his version yet again, even after the spectacular disaster chronicled in Lost in La Mancha. The recent documentary Henri-Georges Clouzot's Inferno, as the title suggests, tries to figure out what happened to what would have been the great French director's penultimate cinematic endeavor. Filmmakers Serge Bromberg and Ruxandra Medrea are the detectives who are picking up the cold case, going back into Clouzot's archives and digging through the remaining cans of film to try to put together the pieces. Production on L'enfer began in 1963. Clouzot had not made a movie for a couple of years, but thanks to hits like The Wages of Fear and Diabolique, he was still one of the top directors in France. Though his previous work had expertly used traditional storytelling to create tight, thrilling pieces of fiction, Fellini's masterpiece 8 1/2 had inspired Clouzot to stretch his perceptions of cinema. L'enfer (a.k.a. Inferno) was his own idea--he would write, direct, and produce--and it was intended to examine the pathology of jealousy. It would star Serge Reggiani (Casque d'or) as Marcel, the proprietor of a lakeside resort with his wife Odette (Romy Schneider, the Sissi series, Le combat dans l'île). Given that Odette was a beautiful and popular woman, Marcel was prone to jealousy, and his fits of suspicion would give way to psychotic hallucinations. Though the common, everyday scenes of L'enfer were to be shot in black-and-white, Marcel's visions would be in color, showing his grotesque view of events. Backed by American money, Clouzot tucked himself away in a studio with his crew and did test after test, looking for new camera tricks that would add life to Marcel's monstrous visions. Most of these experiments still exist, and Bromberg and Medrea gather together some of the remaining crew--including assistant director Bernard Stora (A Major Inconvenience), camera operator William Lubtchansky (The Story of Marie and Julien), and noted director Costa-Gavras (Z), then a production assistant--to sift through the remains. There are make-up tests, all manner of special effects trials, and so many different ways of shooting Romy Schneider's face, it borders on being a fetish. By most accounts, Clouzot didn't know what he was looking for, but he'd know it when he saw it it. A known insomniac, Clouzot was looking to replicate the obsession that gripped his mind and kept him from getting rest. His thirst for perfection was insatiable. Eventually, production was to begin for real, and Clouzot picked a shooting location by an artificial lake. He liked the landscape and the bridges where trains would regularly pass by, the noise of which he would use to trigger Marcel. The downside was that the lake was due to be drained to make room for a power plant, and so L'enfer was to be shot under a strict deadline. Clouzot had three separate camera crews at his disposal, and his plan was to have them all working at once to get the footage he needed. Except you know what they say about the best-laid plans, and Clouzot's, as it turns out, weren't laid very well at all. He would regularly get stuck with the first camera crew, shooting the same scenes over and over. He'd stay up all night writing new scenes, thinking of new ways to go back over material that had already been filmed. One cameraman quit, and Clouzot's lead actors were losing their patience. Eventually Serge Reggiani would leave, too. Clouzot tried to carry on, but a heart attack ultimately stopped everything. It was more than a decade before Francis Ford Coppola would famously suffer a heart attack on his own runaway production, Apocalypse Now. Cinema is bad for your health, it seems. All of this behind-the-scenes drama provides the framework from Henri-Georges Clouzot's Inferno, and as the on-set story unfolds, Bromberg and Medrea reconstruct the rushes that still exist from the shoot. Except for one test reel, all sound has been lost, so much of what we see is used as backdrop for the backstage narrative. Other scenes are reconstructed using the script, occasionally with overdubbing from other actors, and full dialogue exchanges are recreated with Bérénice Bejo (OSS 117: Cairo, Nest of Spies) and Jacques Gamblin (Inspector Bellamy) playing Odette and Marcel. 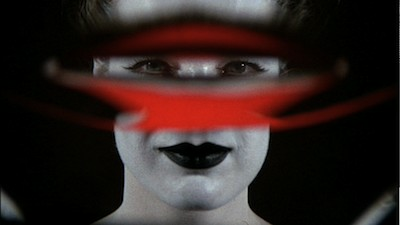 The images that still exist are often breathtaking, and the movie that Clouzot appears to be digging for portrays the endless loop of jealous obsession in ways similar to Alain Robbe-Grillet's avant-garde novel Jealousy and the author's cinematic collaboration with Alain Resnais, Last Year at Marienbad (both efforts prefigure L'enfer by several years). 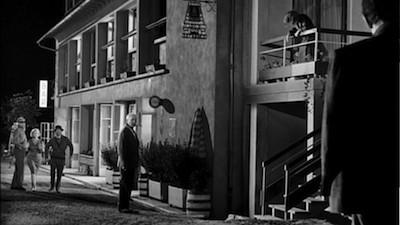 It's hard to say if it's ironic or perhaps by some mad design that Clouzot went about his work in much the same manner that Marcel follows his wife around on her daily activities. He was unhinged and lacking focus, but ultimately convinced that he was right. It makes me think of how Wong Kar-Wai shot 2046 over several years, tossing out whole sections and whacking away at the core concept until he finally got what he was after; Henri-Georges Clouzot's Inferno's makes a good case for L'enfer's potential to have been another towering achievement had its author been able to do the same. In a way, Henri-Georges Clouzot's Inferno is like the best making-of DVD extra you've ever seen, it's just for a movie that wasn't finished. Not that it needed to be for the purposes of this documentary: the story of how it nearly came to be and why it didn't is as fascinating as any scripted drama. Passion, unbendable ideals, hubris--these are the makings of many a romantic tragedy. Henri-Georges Clouzot made only one film after L'enfer sputtered out, and he died in 1977. The late Claude Chabrol eventually took Clouzot's script and made his own version of L'enfer in 1994. I've not seen it, and though my curiosity is piqued, I can't imagine it would quite measure up to the "what if?" scenario put together here. It's something we can never really know, but Henri-Georges Clouzot's Inferno serves as worthwhile tour of what might have been. For their first Blu-Ray, Flicker Alley couldn't have put a better foot forward. Henri-Georges Clouzot's Inferno is gobsmackingly gorgeous in its widescreen 1.85:1 anamorphic transfer. The authoring gives Clouzot's lost footage everything it deserves. The colors are remarkable, full of wonderful flickers and subtle pastel nuances. The black-and-white is also balanced extremely well, giving the lights and darks their full due, including deep, solid blacks. Resolution is sharp throughout. The movie is rendered with such precision, it's hard to believe this is material that was left in some back room for decades on end. Honestly, this may be my new disc to show off to people in order to convince them to buy a Blu-Ray player. Cinephiles can now fetishize Romy Schneider with the same obsessive clarity as Henri-Georges Clouzot always wanted...perhaps even better than he could have even hoped. The Dolby 5.1 mix also sounds amazing, with lots of effects throughout the speakers, amping up the experimental techniques that Clouzot was hoping to achieve. The interviewees and the narration are given priority as necessary, so everything that needs to be heard can be. Henri-Georges Clouzot's Inferno is an out-of-body, out-of-this-world experience, and the soundscape absolutely creates this illusion. English subtitles are embedded in the image. They are white and a little small, but that's a minor complaint. Henri-Georges Clouzot's Inferno is released in a BD case close to regular size, but slightly thicker to have an extra space for the bonus DVD included in the package. The entire film is included on a second standard-definition disc, alongside the Blu-Ray. The case also has a paper insert with images from the film, a statement from director Serge Blomberg, and the DVD credits. Blomberg also provides a 9-minute introduction, which is also on the regular DVD. The hour-long film They Saw Inferno is an interesting thing: a behind-the-scenes documentary about a behind-the-scenes documentary. 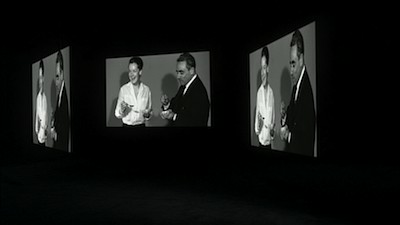 It actually kind of works, as They Saw has a more conventional approach than the more experimental main feature, using extra interview footage and more clips from Clouzot's failed production to create a more nuts-and-bolts account of the shoot, with each interviewee focusing more directly on his or her personal experiences on the set. Finally, we get a lovely image gallery full of stills from the movie and location shots, including many of Romy Schneider standing with the color inversion testing board. DVD Talk Collector Series. Henri-Georges Clouzot's Inferno details a lost cinematic bounty, and as it turns out, is a treasure unto itself. The revered French director of the title had his most personal project derail; the early '60s production was afflicted with misfortune, accidents, and maybe a little of the madness he tried to depict. This documentary digs through the remnants of L'enfer and manages to make a new and fascinating artistic statement out of it. The Blu-Ray is gorgeous, and the extra hour of bonus material makes a perfect complement to the main program. If you love movies, you have to have Henri-Georges Clouzot's Inferno in your collection.